Here’s what the Football Manager 2018 data has to say about the likely line-ups for this match. The explanation for this is here but in a nutshell I’ve treated the Football Manager database like a scouting tool and compared the two teams across a range of measures by combining their in-game attributes. Germany are unsurprisingly the more highly-rated, particularly in central areas. 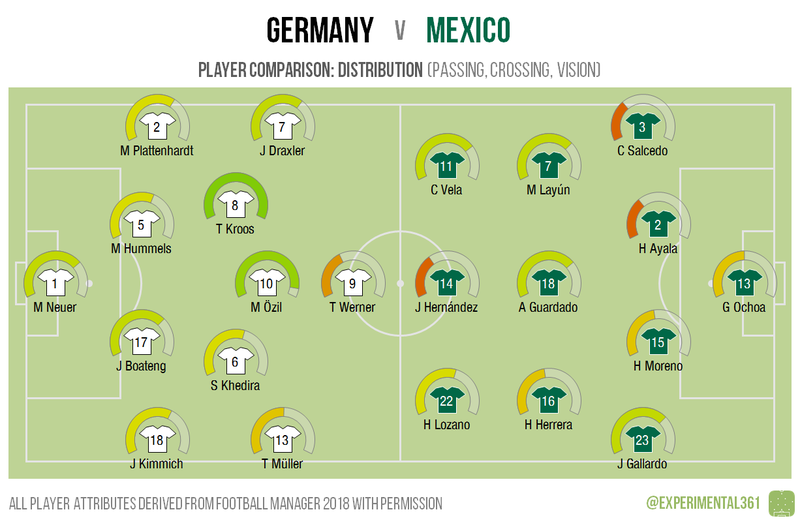 Mexico’s wide attackers – Lozano and Vela – look to be their best players, but getting past Neuer, Hummels and Boateng will be a formidable task. 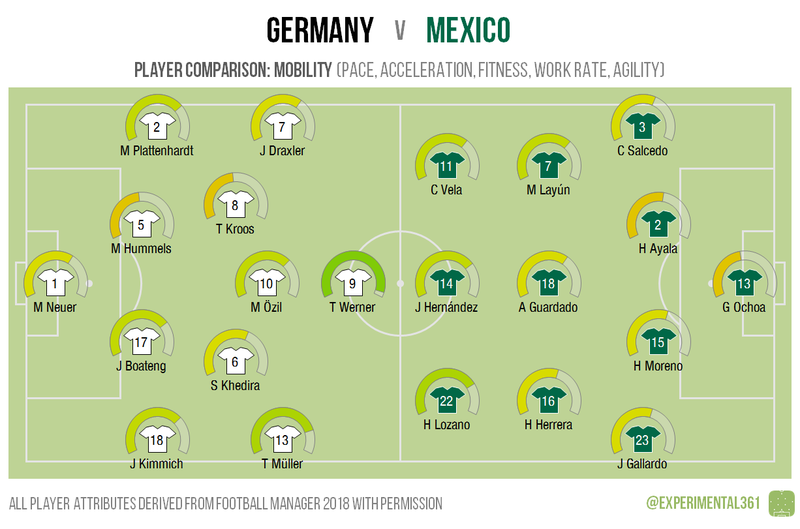 The pairing of Kroos and Ozil looks capable of bossing this game if Mexico let them – they’re two of the best distributors at the tournament. 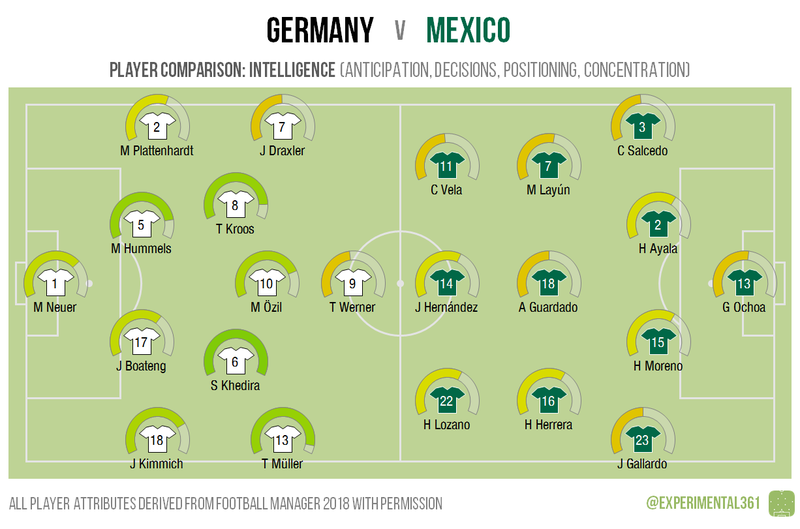 While the left side of Mexico’s front six looks pretty tidy in possession, Ayala and Salcedo behind them could potentially be pressed into losing the ball. The two teams are more evenly matched here, with very few cumbersome players on either side. 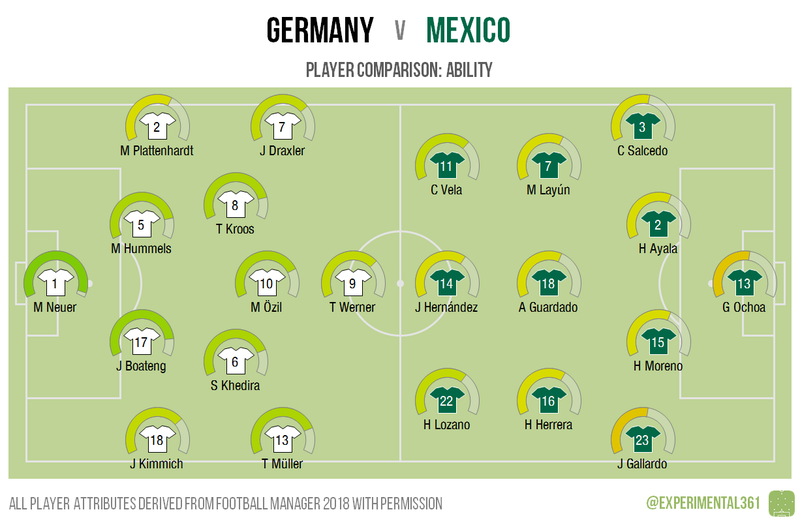 Werner is a real livewire and one of the most energetic forwards in the competition, but Mexico’s forwards – particularly Lozano – look capable of stretching the German defence. The Germans have a clear edge here, with Khedira in particular one of the smartest players at the tournament by the game’s reckoning. While Draxler and Werner may not always make the right choices, the quality behind them means that they’re unlikely to expose their team here.